Failure is our greatest teacher (or something like that). Since the reincarnation of Third Leap, I have been diligently working toward realizing two beer concepts locked away in the deep corners of my mind; a farmhouse ale and a table ale. To date, I have brewed three versions of each, with the table ale being most recent. As a recap, Table Ale #1 was the first failed attempt at a low alcohol, light-bodied, straw-colored, dry, refreshing, and hop-forward grisette-inspired session beer. Four separate foraged yeast isolates were evaluated with this iteration, but overall the beers were underwhelming – underhopped, poorly carbonated, thin bodied, and not very delicious. Table Ale #2 was designed to address the shortcomings from batch #1. In addition, I wanted to garner that signature New England IPA haze in this blonde beer. The result from the second attempt was a beer with the right color and opacity, but an overwhelming amount of fruity (banana) yeast esters that competed with the fruity (citrus) hop flavors. Table Ale #3 was designed to reduce the yeast esters from batch #2 to allow the hops to take center stage. I implemented various techniques to minimize ester production; proper wort aeration, greater height/width fermentor geometry, high yeast pitching rate, and lower fermentation temperatures. The result? – those can be found below! This short-and-sweet graphic will serve as an easy way to gather the greatest takeaways from each beer without having to read the lengthier summary below. 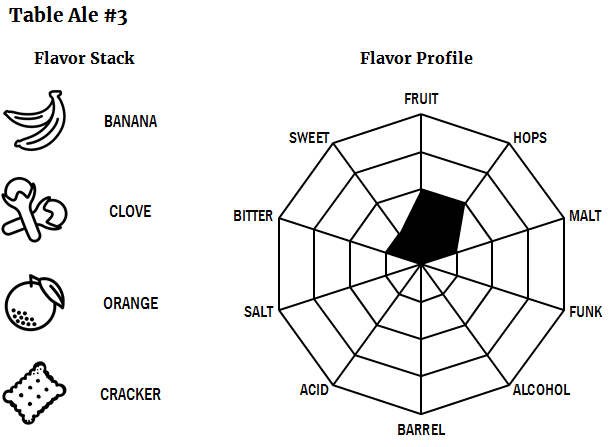 I borrowed the “flavor stack” and “flavor profile” concepts from Second Self Beer Company and Black Project Spontaneous and Wild Ales, respectively. Imitation is the most sincere form of flattery, right? This plugin, created by homebrewer Derek Springer, automatically imports and converts BeerXML files into a WordPress-friendly format! Not only will this save me from manually transcribing recipes into text, but it will allow you to download the recipe’s BeerXML file for direct upload into your favorite brewing software! Appearance – A ridiculously frothy, bright white head fills up 1/3 of the mason glass. Beneath the creamy goodness is a beautifully hazy, blonde hue with golden highlights. Smell – Familiar notes of overripe banana and spicy clove make themselves known with the first big whiff of beer. Soon, the distinct esters and phenols give way to a white bread crust aroma. As the beer warms, faint peach, clementine, orange rind, and lemon become evident. There is also a slight hint of pine tree from the hops. Taste – The flavor draws inspiration from the warm nose – Gatorade Lemon Lime, pulpy orange juice and pith are most apparent. Unfortunately the overall flavor profile is quite neutral, unlike the aromatic nose. The large percentage of pilsner malt yields a grainy cracker flavor which overwhelms the back of the palate. Mouthfeel – The creamy head and high chloride water profile contribute to a soft mouthfeel. Carbonation is medium, falling along the lines of your typical pale ale. Overall – This iteration still misses its mark. Unfortunately, I was unable to reduce the esters (and phenols) to my desired level, leaving the beer more reminiscent of a saison than a hoppy blonde. In fact, the beer is decidedly not hoppy, nor bitter. Changes for Next Time – Welp I’m at somewhat of a loss here. I have tried a variety of techniques to reduce unwanted aromatics and flavors in this beer over the last two batches to no avail. I am a bit discouraged at this point. Maybe the foraged yeast just won’t comply? In any event, I think I may sit on this recipe for a bit to try and figure out where to go next. After all, failure is an opportunity to begin again more intelligently!